How do chefs create the dishes that they make? What lessons can we learn from them to advance ourselves and the food industry as a whole? With each interview, we examine and dissect the creative processes behind taking a dish from conception, through development, plating, and eventually service to reveal the Anatomy of a Plate. 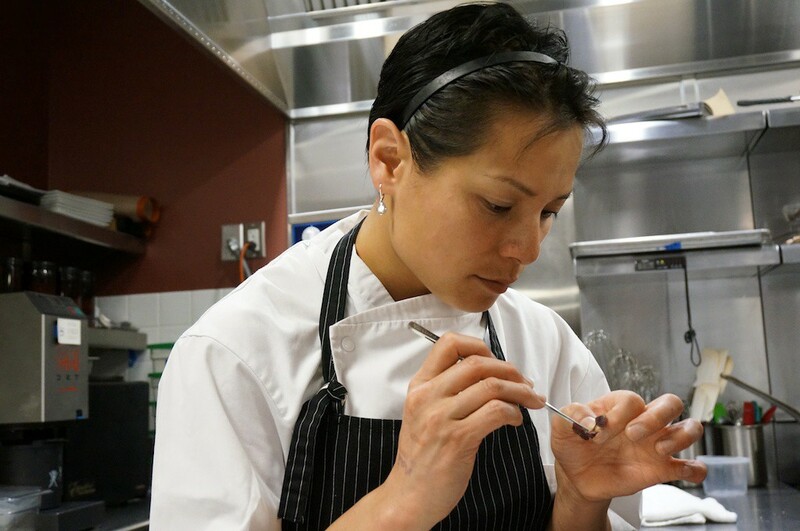 Chef Belinda Leong at a 2013 guest chef dinner at Vintage Cave. 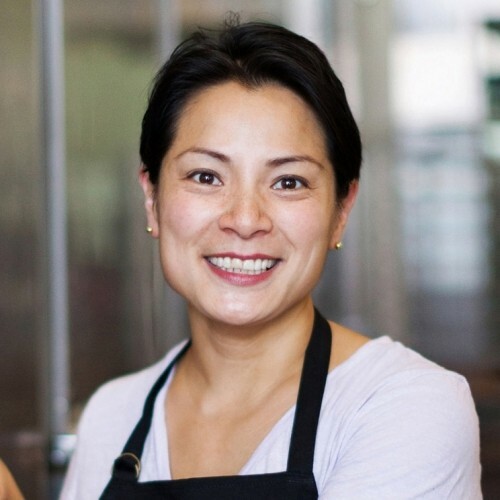 My first introduction to b. Patisserie owner and chef, Belinda Leong, occurred in 2013 when she participated in a collaboration dinner at Vintage Cave. I entered the kitchen and chef Chris Kajioka handed me one of Leong’s freshly baked kouign amanns. “Here, taste this,” he commanded. It was and is the best kouign amann I have ever tasted. “You never know what will spark an idea, so I just observe a lot and see what’s going on,” says chef Leong who can seemingly find inspiration anywhere. Once I went to an ice cream shop and saw an all black ice cream. I didn’t even taste the ice cream; I was just amazed at the fact that all these people were eating a coconut ice cream that was all black. That gave me an idea, what if I made a menu that was all colors? Talking to Leong is like having three conversations at once. One question can send her blasting off into three different tracks of thought. Each is a cohesive, and distinct thought that, if they were expressed separately, would be easy to follow. The way she jumps from idea to idea was instantly recognizable to me. I could follow her various thought pathways because fortunately, my brain works the exact same way. I refer to it as a “What If/Then” trigger. The process begins when someone asks a “what if” question, which triggers a “then” response that can go into a myriad of different directions. The process builds upon itself with each “then” response, becoming the next “what if” question. Some of the most interesting dishes in my personal repertoire is a result of someone asking me a, “what if” question. 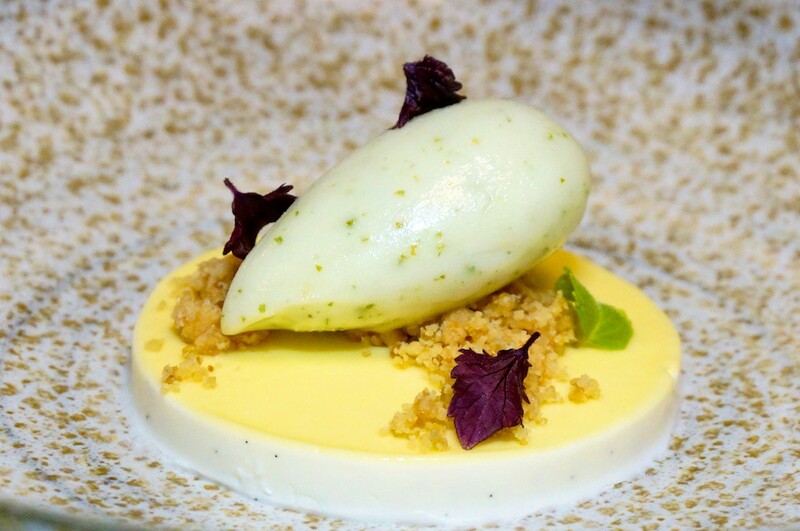 Leong’s Greek yogurt panna cotta with lilikoi cream, demerera sugar crumble & shiso sherbet at her Vintage Cave collaboration dinner. 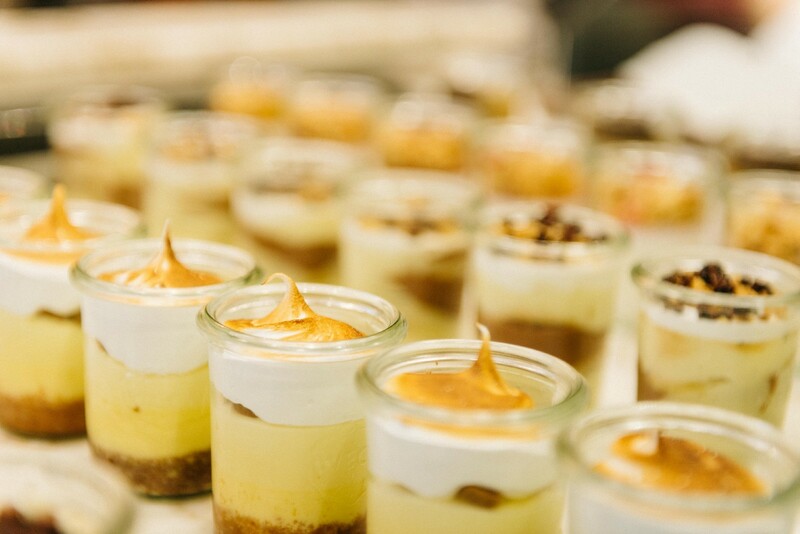 When planning a dessert, Leong, always works with no more than three flavors. Even with only three flavors, a lot still needs to be taken into consideration. The flavors need to compliment each other. At least one of them is something in season. But, most of all, Leong points out that you have to consider how they flavors eat together. Once she knows what flavors she is working with, she moves on to the components. One flavor could be a cake, while another could be a ganache or a mousse, and the third could be a crumble. 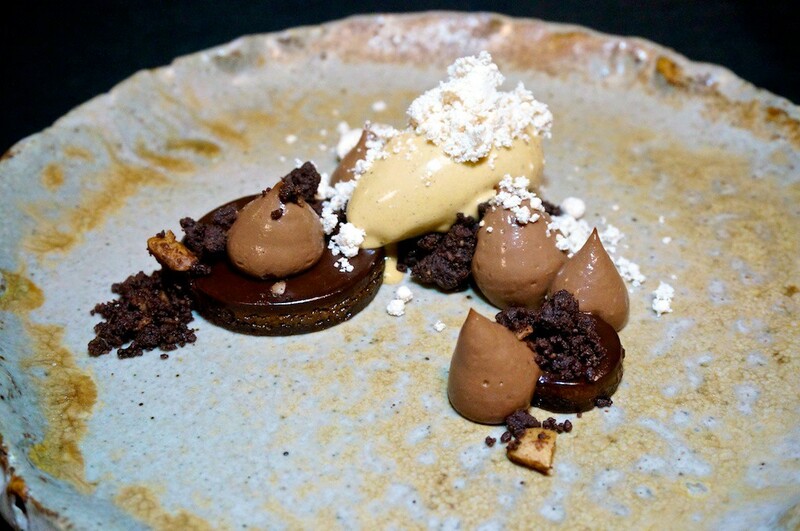 Another thing that Leong takes into account while planning out her dessert components is texture. We spent a lot of time during our interview talking about texture. I had never stopped to consider the myriad of textures that were possible, at last not to the extent that Leong has. “There’s dense creamy like a crème bruleé that’s richer and heavier. There’s mousse which is airy, but then there’s whipped cream that’s airier than mousse. Then, there is pudding that has the density of crème bruleé, but not as heavy. You wouldn’t pair some textures together because one may weigh the other down. A rich creme bruleé would not pair well with a fudgy brownie because they are both so dense. Whipped cream on the other hand, which is light and airy would go good with a brownie. Then you can add ice cream and make a sundae, and you can feel all the different textures in your mouth. I always knew that crème bruleé wouldn’t pair well with a brownie, however that was mostly instinctual. I never actively thought about why they wouldn’t work together. 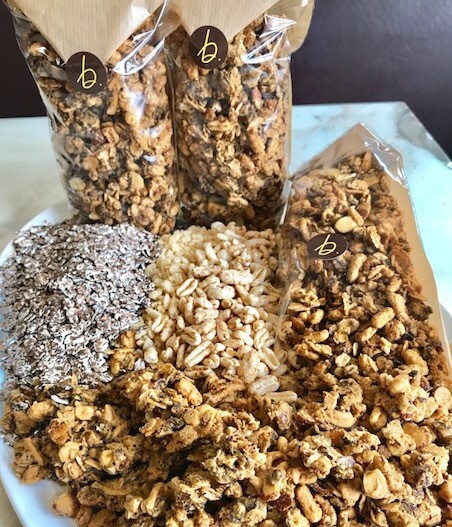 When it comes to talking about texture, it is obvious that Leong is most proud of her shop granola. Despite her affection for texture, Leong knows to keep herself in check. Just like how you can confuse the palate with too many flavors, you can go overboard textually as well. “What if/Then” is a great flaring process to generate a lot of ideas very quickly. The drawback is that the frantic nature of ideation can easily spiral out of control until the ideas become jumbled and you loose sight of what you were initially designing. It’s only part of a creative process. Once you have all these ideas, they must now be distilled down, and funneled into something workable. Selection of desserts from b. Patisserie. 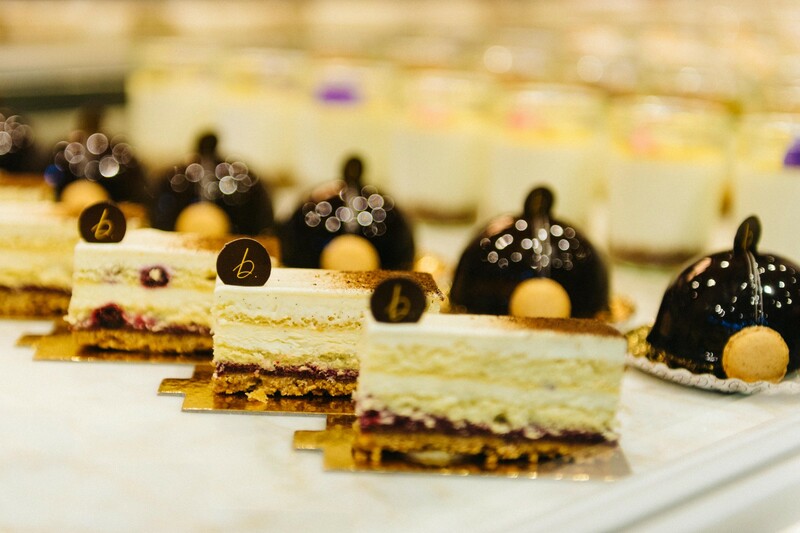 At b. Patisserie, they refer to any assembled cake or mousse that is sliced as a “cake montage.” Cakes maybe the stars of the display case, but Leong admits that she can play more with verrines. When you are working on an assembled cake, you have to worry about the structure, and it being able to sit for a certain amount of time. This is not the case with verrines because the cup supports the weight of its contents as supposed to the dessert being free standing like a cake. Selection of verrines from b. Patisserie. 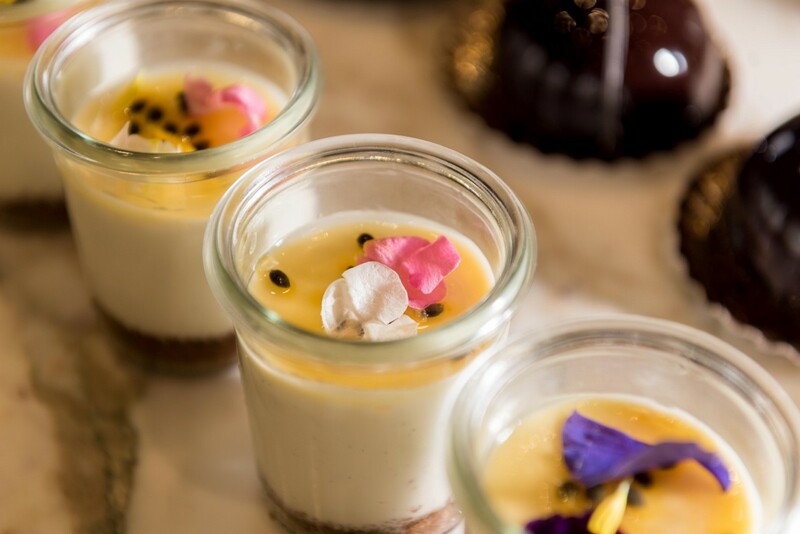 Whether it be a cake, verrine or pastry, Leong mentally visualizes the components and how they interact together before she physically makes anything. “When I’m designing a verrine, I pretend that I’m putting a fork down the cup,” says Leong, describing what she sees in her imagination. Virtually every chef that I have interviewed for Anatomy of a Plate has some sort of visualization mechanism or tool that they use when conceiving their dishes. Chef Leong is no different. If you can make the dish work in your head, then you can make it work on the plate. However, when she needs to, Leong can jump start the process by giving herself a deadline, like having to come up with a menu before the end of a plane ride. Leong’s flourless chocolate cake with crispy crepe and chocolate ganache with caramel coffee ice cream, fleur de sel caramel and chocolate sable cookie crumble from her Vintage Cave collaboration dinner. When you are able to generate ideas quickly, it is very important to know when to stop, and for Leong, she very clearly defines it as when she can feel all the components textually in a dessert, and identify all the flavors individually even though she is eating them all together. Leong was recently challenged to serve a savory dish at the upcoming, Food Fight event for Hawaii Food & Wine Festival. Despite having to do something different, she stays within the realm of what she knows. Leong is known for her kougin amanns, and she knows enough about making them that she is confident that she can make a savory version. 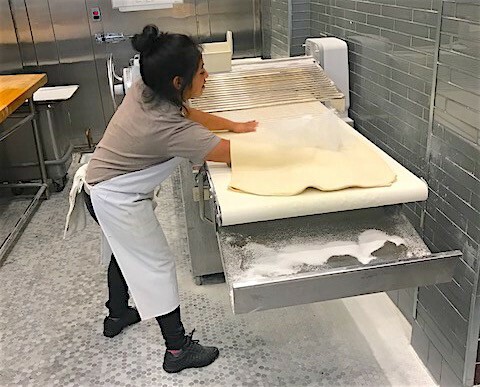 Rolling kougin amann dough at b. Patisserie. I admire her ambition. It would have been easy to use the bacon and onions as a filling in the center of the kouign amanns, but she most likely didn’t get to where she is at by doing what was easy. The difficulty of any laminated dough lays in not breaking the layers of fat during the rolling and folding process. Adding sugar to the layers creates another twist, however, the process is still manageable. The x-factor for Leong will be the onions and cooked bacon, specifically, the added fat from the bacon, which could make the butter layer softer and more prone to separating. Successful chefs push their skills pass what is comfortable. That’s the only way that new dishes are created. 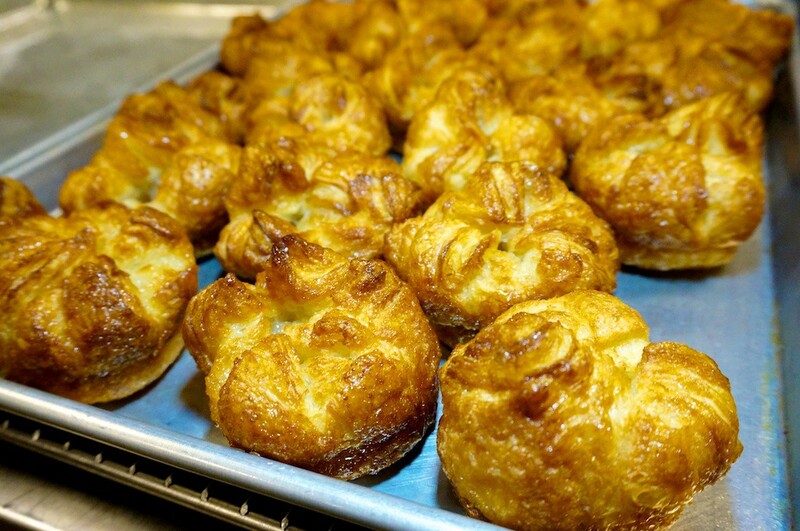 It seems that a savory kouign isn’t enough of a challenge for Leong, because she is also making a second dish for the Hawaii Food & Wine Festival. Taking from her Chinese heritage, Leong is making a Shanghai style Hong Shao Rou (red cooked pork) using Big Island pork. She then plans to use that as the center of a fried potato croquette and serve it with an Asian gribiche sauce. She had me at bacon kouign, and I’m staying for the pork croquettes! Kouign Amanns and other pastries at b. Patisserie. All chefs are different in how they put ingredients together. In terms of flavors, Leong says that she is very classical, which makes b. Patisserie both approachable and familiar. 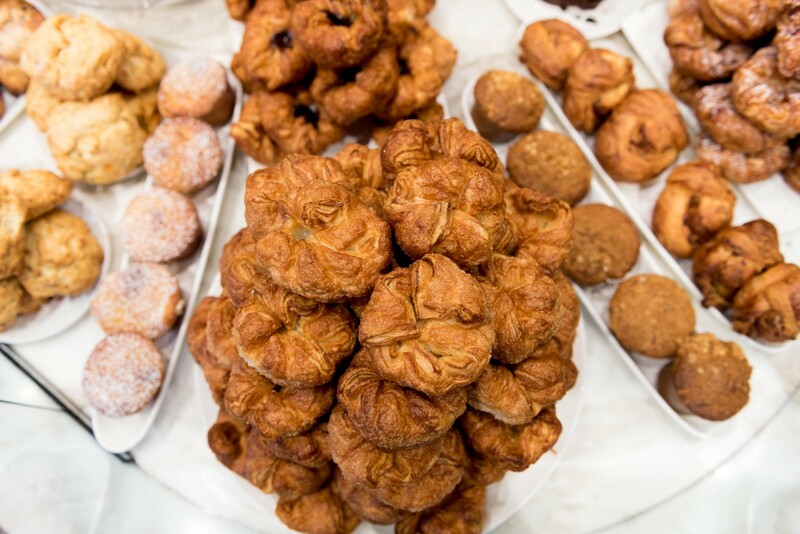 A place where people can go every day to get their pastries, and they’ll always have the same experience. Combinations like chocolate-hazelnut, or s’more, may seem over done, however they are people’s favorite flavors for a reason, because they work. However, I recognize that there are definitely times when I’m over thinking flavors, and pairing things together just for the sake of being different. That is a great question, that I wish I had thought to ask. When designing a dish, we have to consider whether or not it can stand out on a menu once the novelty wears off. It’s fun to experiment with new flavors, but sometimes we as chefs need to take a step back. We can look to classical flavor combinations and ask ourselves, how might we present familiar flavors to the customer in a different and modern way?